NYC, 04/30/2019, 6:30PM. 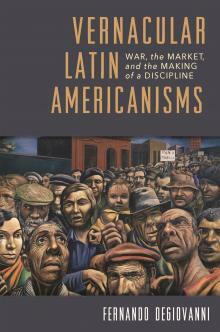 Vernacular Latin Americanisms: War, the Market, and the Making of a Discipline. Fernando Degiovanni's book offers a long-view perspective on the intense debates that shaped Latin American studies and still inform their function in the globalized and neoliberal university of today. By doing so he provides a reevaluation of a field whose epistemological and political status has obsessed its participants up until the present. The book focuses on the emergence of Latin Americanism as a field of critical debate and scholarly inquiry between the 1890s and the 1960s. With: Graciela Montaldo (Columbia University) and James D. Fernández (NYU).